I love terns. I find them graceful, entertaining, and a symbol of some truly incredible migrations. Plus, there was once a time when I couldn’t tell a tern from a gull, let alone differentiate between species. My relative identification ease now makes me feel good about myself as a birder, and since the terns are causing my inner birder glow it’s no surprise that they are my favorite. My new home base offers pretty good locations for tern-watching. Least Terns nest on Navarre Bridge and along the dunes of the Emerald Coast; Royal Terns are common, as are Sandwich Terns. I’ve seen Forster’s Terns and Common Terns, but one particular species was fast becoming a nemesis bird: the Black Tern. 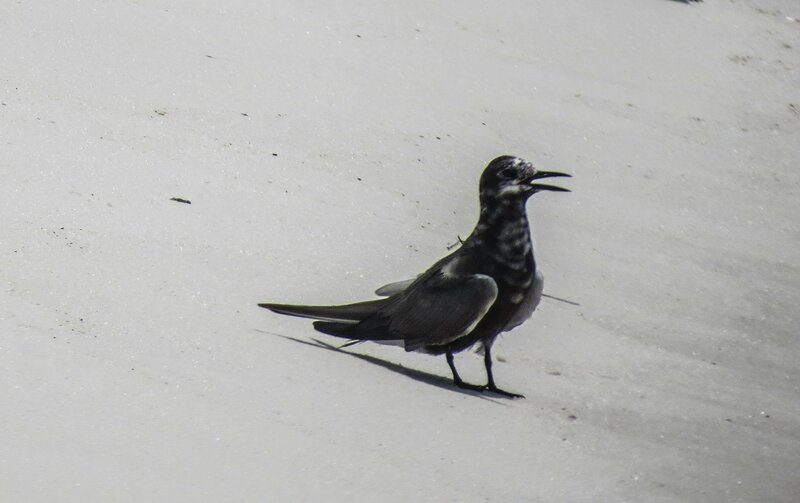 Black Terns do not breed or over-winter in Florida, they merely migrate through on their way to Central and South America. In terms of looks, their breeding plumage is the polar opposite of all other tern species: a deep ebony, truly striking. Though their non-breeding markings are more “traditional,” they are still very easy to tell apart from other terns. And yet, every time I thought I saw one I never had my camera or even a pair of binoculars. I would be walking along the beach or swimming, when all of a sudden terns would cruise by along the surf. The light would be bad, or they would be far away and just zoom by too quickly for me to see anything but a darker-than-usual silhouette, not enough to make any type of correct identification. I would try to stalk them on other days, decked out in all the equipment I could find, only to have them elude me. It was maddening. 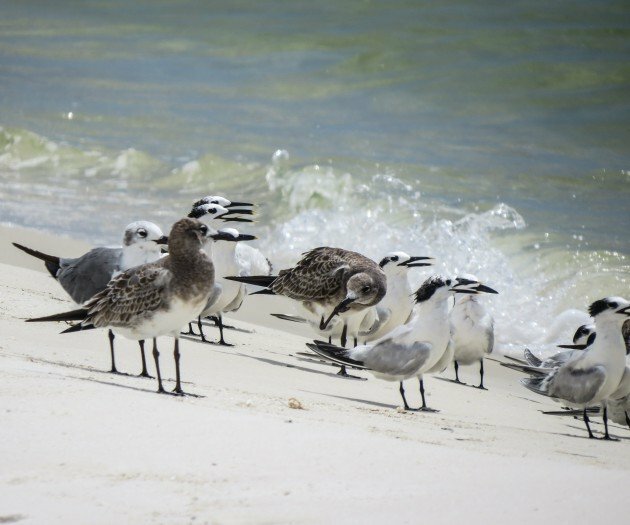 Over the weekend my husband and I decided to take a boat ride over to the Fort Pickens area of the Gulf Islands National Seashore. I adore all protected areas along the barrier islands. Their gentle rolling dunes, pristine beaches, and lack of people create an ideal landscape for me, not only for exploring but also for birding: the fewer the people, the more birds I inevitably see. As we approached I noticed almost no colored umbrellas or bright beach towels, and inwardly gave myself a high five. We were motoring contentedly along when suddenly we spotted a horde of gulls and terns, making a racket and dive bombing the surface. Upon approach, we saw the water practically boiling with silvery bait fish, thousands simultaneously breaking the water and providing a buffet for the circling birds overhead. There were Sandwich Terns, Laughing Gulls, Forster’s Terns, and something different. Smaller terns were also zipping around, with darker wings…darker heads… black bills… I thankfully had brought a camera with me, and when I zoomed in on a captured image I whooped for joy: a Black Tern! There were hundreds of Black Terns about, which are known to migrate in flocks. When we stopped at the beach they flew overhead, but a handful were also perched on the sand, providing better observation opportunities. 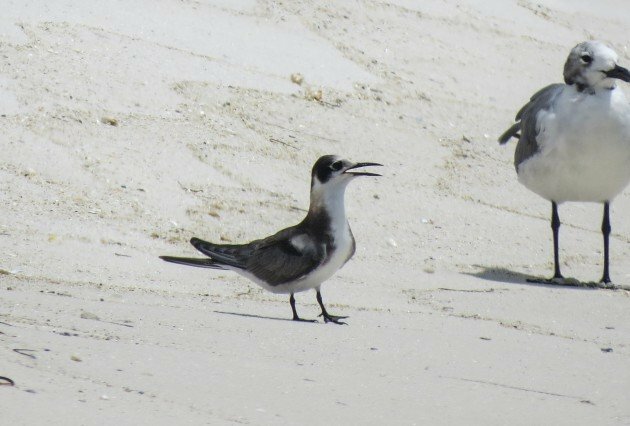 Though most were in non-breeding plumage, one was still nearly all black, a magnificent contrast to the white sand and the other white terns. A few Common Terns and Least Terns were also among the group, bringing my tern total that day up to five species. While I was fortunate enough to see hundreds of Black Terns, their numbers are in steep decline. According to the Cornell Lab of Ornithology, their populations have decreased by over 3% between 1966 and 2010, resulting in an overall population decline of 78%. Because of this, they have been listed as a “Common Bird in Steep Decline.” Habitat degradation and loss are contributors to the problem, and as birders we must take action in order to protect the breeding habitat of this beautiful bird.